Inspire, Educate and Empower – Rothesay Joint Campus lead the way! Home » Featured » Inspire, Educate and Empower – Rothesay Joint Campus lead the way! In an imaginative collaboration, Rothesay Joint Campus have joined with Fyne Futures, to merge inter-disciplinary learning with Zero Waste Bute. A full day of activities involved teachers and learners that contained serious learning across a number of subjects and explored the issue of sustainable waste management. Before of the big day XL pupils will created a photo story of litter ‘hotspots’. Pupils from Secondary 1 began the day with a brief talk about recycling and the value of managing waste, and improving the amenity of the school by reducing litter. The two house teams ran a scavenger race to compete for best recyclers, armed with a forest of litter pickers. 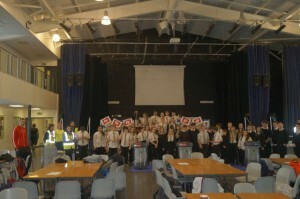 Fyne Futures Recycling Team demonstrated how waste becomes a valuable resource through sorting process. The children then transformed the school into a recycling hub, by distributing recycling bins. Diverting from landfill and measuring the positive impact will become routine part of school life. “We have really appreciated the opportunity to work with teaching staff and pupils at Rothesay Joint Campus on the project, which we believe will demonstrate that Zero Waste Bute is an exemplar of best practise, and its good fun too!” said Reeni Kennedy-Boyle, Project Lead. Have a look at our short video here.